Find out why indoor Barn Owl nestboxes are the best option. Do you have a suitable building? At least 4 metres high. With an opening or hole at least 3 metres above ground level which overlooks open countryside. Where the nestbox can be positioned 3+ metres above the ground. Where the nestbox access hole is visible to an owl from the most likely entrance point. Ideally within 1 km of areas or strips of rough grassland. It doesn’t matter what the building is made of, or used for, and its position in relation to your house makes no difference. Barn Owls can learn to tolerate noise and activity as long as they have something to hide in – such as a nestbox. When choosing the building and the owl box position, remember that Barn Owls are interested in openings and holes rather than buildings or boxes. The way in needs to be visible. 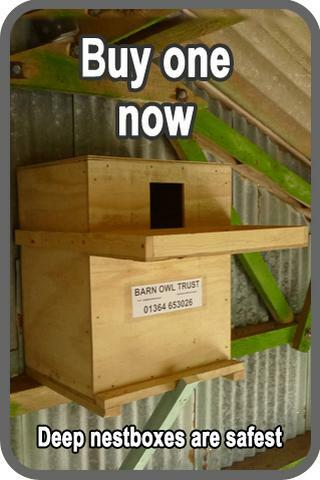 See our photo gallery suitable positions for Barn Owl nestboxes in buildings. See a photo gallery of openings and holes that are attractive to Barn Owls. Inside the building, the owls will benefit from the additional shelter. Outside they are more exposed. An indoor Barn Owl nestbox is not suitable for outdoor use, and an outdoor nestbox is much better placed in a tree – because trees usually afford more shelter and owlets can sometimes climb a tree to re-enter the box. A box on the outside will only last about 10-15 years. A box on the inside will last as long as the building. Nestboxes designed for indoor use are quicker, cheaper, and easier to build. Or cheaper to buy. Most old barns are good places for nestboxes – without one only 48% have a nesting place. Barn Owl nestboxes in the UK should be placed inside rural buildings that overlook open habitat. Avoid urban, suburban, dense forest and high mountain areas. Sites within 1 km of a motorway or other fast, unscreened, main roads should be avoided due to the risk of road-deaths. 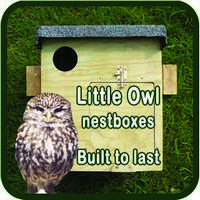 Nestboxes do not need to be placed directly on patches or strips of rough grassland as the birds are perfectly capable of ‘commuting’ across unsuitable habitats before starting to hunt and have very large home ranges. Check to see if your local landscape is suitable. 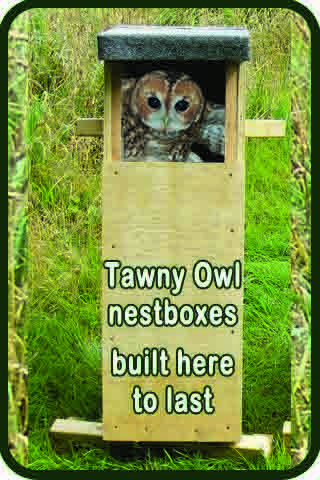 Modern barns are very often perfect for nestboxes but without one, 97% are unsuitable for Barn Owls. Construction and plans for Barn Owl nestboxes. Where to position a nestbox in a building. How to put up Barn Owl boxes. Nest box criteria for assessing other plans or designs for interior Barn Owl boxes. Poor design can be fatal. 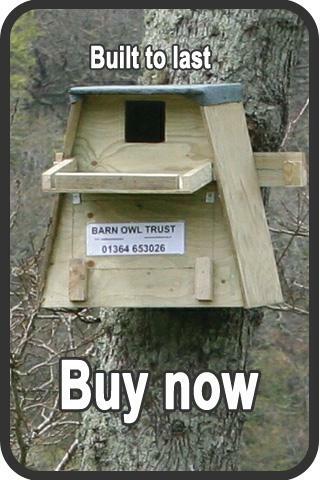 Or you can simply buy a Barn Owl Trust nestbox for inside a building. The dimensions given on the owl box diagram below are the minimum required size. An ideal nesting box would be much bigger: a full 1 metre from the bottom of the entrance hole to the bottom of the box and with a floor area of at least 1 metre x 1 metre. However, owl boxes that big would be very difficult to erect and more expensive to build. The basic box should be built using 9mm FSC approved plywood and 50 x 25mm batten. Softwood ply (usually Scandinavian or Canadian) is perfectly adequate, cheaper, and better for the environment than hardwood. We use 30, 40 and 50mm screws but nailing and/or gluing is perfectly acceptable. Watch the video at the top of this page or have a look at our photo guide – How to build an indoor Barn Owl nestbox. Our deep nestbox design is very safe for owlets due to a 450mm drop from the entrance hole to the bottom and an exercise platform with a raised edge. Watch the video below or have a look at our Photoguide: How to put up an indoor nest box for Barn Owls – showing the 5 possible methods to use when erecting indoor Barn Owl nestboxes. Each method is suitable for different types of barn or farm building, depending on the construction. Maintaining the internal depth of the nesting box reduces the chances of a nestling Barn Owl falling from the box and dying as a result of neglect or predation. Therefore it’s important to clear it out if there’s more than about 75mm of nest debris. If Jackdaws use the box it must be cleaned out every year (wear gloves and a dust mask). Boxes only used by Barn Owls and/or doves will need clearing out every 2 or 3 years at most (unless the owls have very large broods of young or breed more than once a year in which case they should be cleaned out every 1 or 2 years). It’s usually best to clean out nestboxes between November and January so as not to disturb breeding Barn Owls (which is illegal – see Barn Owls and the law). The most important thing when erecting the box is your own safety! Before erecting a box, please ensure that you have properly assessed the risks involved, particularly with regard to working at height. 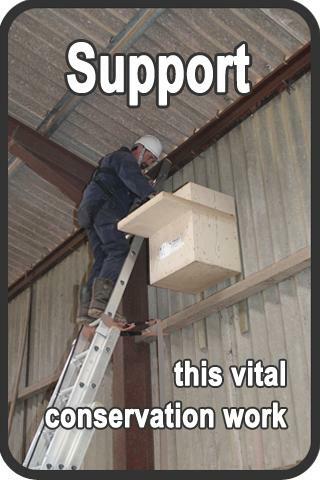 A nestbox is quite heavy to lift single-handed and using ladders is potentially dangerous. Please do not work alone and consider using two ladders or safer methods. Entrance hole: Optimum size 130 x 130mm; minimum 100 x 100mm; maximum 150 x 150mm. Floor area* of nest chamber: Good size range 0.2 to 0.4 m2. Absolute minimum 0.16m2. The floor of the box featured on this page measures 500 x 400mm giving a floor area of 0.2m2. Depth* from bottom of entrance hole to nest floor must be not less than 450mm. *Note: The ideal floor area size is 1m2 x 1m deep but such big boxes are generally impractical. For American Barn Owls all the minimum dimensions except the entrance hole should be increased by 50%. For any Barn Owl nestbox less than 700mm deep, an exercise/landing platform below the entrance hole is vital for the safety of young fledglings. Climbing/jumping young birds can get from the platform onto the roof of the box and (ideally) onto other nearby perching places. 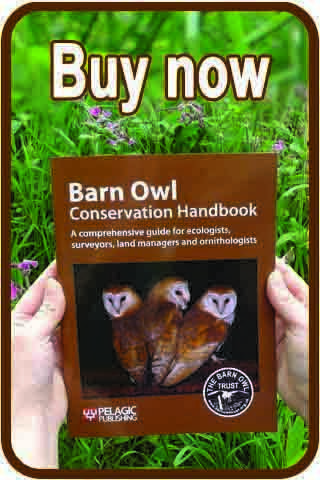 The platform must have a generous raised edge suitable for Barn Owls to grip easily. 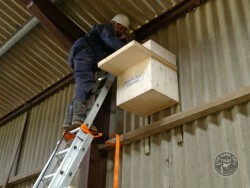 Measures aimed at reducing the chances of entry by other species (such as Jackdaws) are to be encouraged provided that they do not significantly reduce the box’s suitability for Barn Owls. In mainland Europe, measures to exclude Beech Martens are an important consideration. Weight: Should be substantially constructed yet light enough to permit safe erection using basic equipment. Normal indoor-box weight range is 10-15 kg. Total weight for erection by hand should not exceed 18 kg and an indoor-box under 8 kg is probably not substantial enough. Materials: Should not be constructed from tropical hardwood unless the timber is certified as sustainably grown. Height of at least 3m above ground level. Position where the box will be completely dry for many years. How to maximise the chances of occupation (entrance hole visibility for birds flying into the building and building entrance visibility to birds flying outside). The need for clearing out debris so as to maintain internal depth. Box erection and attachment methods, human safety issues. Barn Owl nestboxes should generally not be within 1 km of any motorway, dual-carriageway or similar unscreened major road. Avoid poor nestbox design – which can kill owlets.